I have made a pact with the kajillion squirrels who live in my ancient hackberry, the next-door neighbors’ equally ancient pecan tree, and the rest of the neighborhood forest. The terms are simple: the squirrels are welcome to live here and frolic about to their heart’s content as long as they stay out of my containers. My pots are terra cotta non grata. Squirrels are feckless, forgetful creatures, however. They haven’t always lived up to their part of the agreement, so I remind them with rocks only a bit smaller than my fist that I set around the green things in the containers. I press the rocks into the soil so they’ll stay put, and then I mulch around and on top of them. When I plant seed I use another mnemonic device: I put a cake rack over the pot. I find cake racks at garage sales, but I suppose one could buy them. 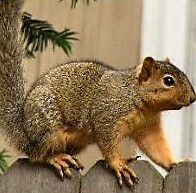 I have been known to dust the soil with cayenne pepper, which the squirrels find obnoxious. And almost every time I do, it rains forthwith, and I haven’t found this a useful reminder. Likewise, rain mitigates the effectiveness of rabbit blood, available commercially. If you are unwilling or unable to negotiate with squirrels, you can invest in Plantskydd, a granular, organic, small animal deterrent advertised as non-toxic, safe for food crops, and long lasting. A one-pound canister was $14.99 a year or so ago. I used about half of it, to no avail, before I made the deal with the squirrels.